Our friends Rosebud Preserves join us on Thursday 20th April, at our Visitor Centre in Hawes. They’ll be sampling their delicious range of artisan chutneys, specifically created to pair with our handcrafted cheeses. Our friends Little Red Berry join us on Friday 21st April, at our Visitor Centre in Hawes. They’ll be sampling their delicious range of artisan gins. Our friends Ampleforth Abbey join us on Thursday 20th April, at our Visitor Centre in Hawes. They’ll be sampling their delicious range of craft beer and cider. 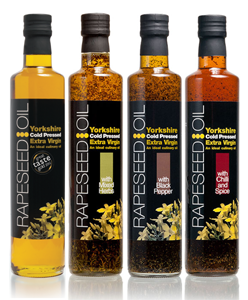 Our friends Yorkshire Rapeseed Oil join us on Wednesday 19th April, at our Visitor Centre in Hawes. They’ll be sampling their delicious range of artisan rapeseed oils. Our friends Masons Gin join us on Tuesday 18th April, at our Visitor Centre in Hawes. They’ll be sampling their delicious range of artisan gins.